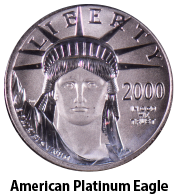 PLEASE NOTE: Liberty Coin Service does not accept online orders for platinum bullion items. For price indications, refer to our Daily Quotes Price Page. If you wish to order any of the items listed below, please call us toll-free at 800-527-2375 for up to the minute pricing.